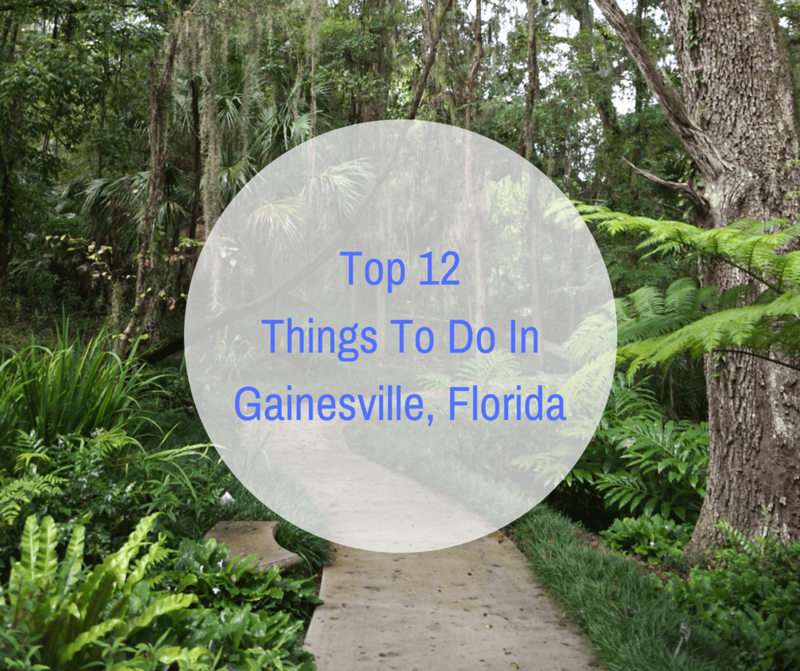 There are so many fun things to do in Gainesville, Florida! Enjoy the outdoors, immerse yourself in local history, or chow down on amazing cuisines. We loved the time we spent in Gainesville and would recommend a visit to anyone! Below are our favorites things to see and do. The Harn Museum of Art is on the University of Florida campus. Inside, visitors will find over 10,000 pieces of art ranging from ancient to modern, and objects from all over the world. The museum also includes five garden areas that incorporate art, which we thought was really cool. Next door to the Harn Museum is the Florida Museum of Natural History. If you’re traveling to Gainesville with kids, this is definitely a place you want to visit. Exhibits include a variety of Florida fossils, displays about the Native Americans in South Florida, and information on Florida’s wildlife and ecosystem. The museum also has a Butterfly Rainforest, with daily butterfly releases. Walking through lush flowers and trees, listening to a cascading waterfall, with butterflies flying all around was an awesome experience. Note: Admission to the museum is free but there is a cover charge for the Butterfly Rainforest. Visiting the Santa Fe College Teaching Zoo is considered one of the top things to do in Gainesville with kids. And even if you don’t have kids, this place is great! It’s one of only two teaching zoos in the country and is maintained by students enrolled in the college’s Zoo Animal Technology Program. It was amazing to see such young people taking such good care of the over 75 species of animals at the zoo. Their passion and love for animals was obvious. They were also very knowledgeable and answered any questions we had as we walked around the grounds. The zoo itself was great, but we think the staff and their enthusiasm made the visit even more special. Spending a few hours at the Kanapaha Botanical Gardens is a must! There is a paved walkway that is a mile and a half long that goes through 24 collections. Our favorite was the bamboo garden, which is the largest public display of bamboo in Florida! There was also a really nice herb garden, a small labyrinth, and a couple of waterfalls. Really, it’s just such a relaxing and beautiful place to go for a stroll. If you’re looking for outdoor activities near Gainesville, head on over to Devil’s Millhopper Geological State Park. The area has been attracting visitors since the early 1880s, and for good reason. There is a sinkhole in the middle of a pine forest that is 120 feet deep! It’s lush and cool because of the shade. Fossils and shells have been found in the area too, making it a great place to learn about Florida’s natural history. The stairs are no joke! Another fun outdoor activity near Gainesville is hiking along the La Chua Trail At Paynes Prairie. Most of it is on a raised boardwalk but ends on a grassy trail (it’s about 3 miles round trip). Visitors will see the Alachua Sinkhole, as well as marsh land and wildlife that could include alligators, bison, and many different bird species. Gainesville is home to the University of Florida (Go Gators!). Visitors can walk around campus and see unique structures like Century Tour, a 157 foot tall tower with 61 bronze carillon bells that play every quarter hour. If you prefer a guided tour given by a current student, you can click here for more information. We always try to seek out any kind of veterans memorial in any city we visit. Since Vicky was in the Army, it’s something near and dear to our hearts. The Veterans Memorial in Gainesville is one of the best we’ve seen. The bricks used really gives you a sense of all of the lives that have been lost. We had no idea that Gainesville had such great street art! We definitely recommend driving around town with your camera at the ready. You can click here to see some of our favorite Gainesville street art. How cool is this?? In Gainesville, you can find a scale model of our solar system! The distance from the sun to Pluto is approximately 3.6 billion miles, but here it has been scaled down to 0.9 miles. The structures were created with recycled materials and include not only the planets, but also stars and comets. Each planet also has an information plaque with interesting facts. This greenspace has been a major hit since it opened. There is a train-shaped jungle gym, a splash pad area, and plenty of open space to walk, jog, or have a picnic. If you’re a foodie, you will love Gainesville! One of the best things about Gainesville is the amount of incredible restaurants they have. For more information, check out our guide to the best restaurants in Gainesville. There’s also an amazing Gainesville brewery called Swamp Head Brewery that we highly recommend. LaChua trail is partially closed since hurricane Irma due to remainging high water. Jan 2018, still very high. Oh no, we didn’t realize the water was still so high. Hopefully it goes down soon, it’s a lovely place to explore. Thank you for the heads up Louenis! Good to know, thank you David! This is a great collection of ideas for a Gainesville visit. I’m particularly drawn to the natural history museum wtih butterly rainforest, what a great combination on one site! I’m also a huge lover of botanical gardens, which I really like to visit when travelling. Likewise, the Geological State Park looks like both a fascinating learning experience and a beautiful place as well. I’ve only ever stopped in Gainesville as a pit stop en route to Tampa but it looks like I need to spend some time here. I would love the butterfly forest and Devil’s Millhopper State Park. The natural beauty is really something. Kanapaha Botanical Gardens seems like something my 6-year old would enjoy. The Museum of Natural History also looks cool. We are doing US west coast this summer, but marking Florida for another family trip. I’ve never thought of Gainesville as a foodie or street art kind of place, but what a cool revelation! I love the look of Devil’s Millhopper Geological State Park – what a fascinating place to explore – you can see why it has been popular for so long. That fried shrimp and cornbread looks so yummy! I’ve visited butterfly forests in Australia and Scotland, and being surrounded by butterflies is such a great experience! I had no idea there was so much to do in Gainesville. The teaching zoo sounds great and the botanical garden looks beautiful. My must do would have to be Devil’s Millhopper Geological State Park! I have to say I had never heard of Gainesville (although I was thinking it sounded like somewhere I had been in TN) but it looks like there is plenty to do. The parks and sinkholes look well worth a visit. Considering I had never heard of Gainsville before reading this post, it seems like there is a lot to do! The Solar walk is a great idea, I would love to do this. Gainsville looks rather tropical. I was surprised by your photos, I didn’t imagine it would like that when I clicked on the article! Certainly looks like a place worth checking out! Honestly, I had no idea that there were so many cool things to do in Gainesville! Devil’s Millhopper sounds really intriguing. I love exploring lesser-known state parks. Century tower also looks quite stunning! Wow! Gainesville seems so charming and definitely worth exploring. I must admit this is the first time I am hearing about it. I fell in love with the botanical gardens. How many days would be enough to explore Gainesville? Hi Agnes! There’s a lot to do in Gainesville, so I would say 3 days at a minimum.